Over the past twenty years, Neil Gaiman has developed into the premier fantasist of his generation, achieving that rarest of combinations—unrivaled critical respect and extraordinary commercial success. From the landmark comic book series The Sandman to novels such as the New York Times bestselling American Gods and Anansi Boys, from children’s literature like Coraline to screenplays for such films as Beowulf, Gaiman work has garnered him an enthusiastic and fiercely loyal, global following. To comic book fans, he is Zeus in the pantheon of creative gods, having changed that industry forever. For discerning readers, he bridges the vast gap that traditionally divides lovers of “literary” and “genre” fiction. 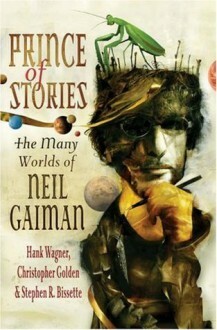 Gaiman is truly a pop culture phenomenon, an artist with a magic touch whose work has won almost universal acclaim.Now, for the first time ever, Prince of Stories chronicles the history and impact of the complete works of Neil Gaiman in film, fiction, music, comic books, and beyond. Containing hours of exclusive interviews with Gaiman and conversations with his collaborators, as well as wonderful nuggets of his work such as the beginning of an unpublished novel, a rare comic and never-before-seen essay, this is a treasure trove of all things Gaiman. In addition to providing in depth information and commentary on Gaiman’s myriad works, the book also includes rare photographs, book covers, artwork, and related trivia and minutiae, making it both an insightful introduction to his work, and a true “must-have” for his ever growing legion of fans.